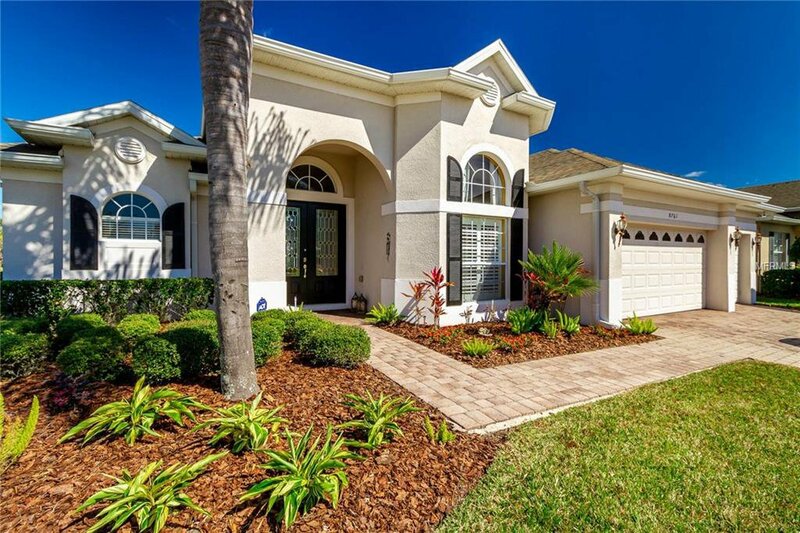 Orlando Luxury living awaits you at this pristine private gated upscale community at VISTA LAKES VLGS. WARWICK. Situated on one of the best lots with home front water view. This sought after three-way split floor plan offers 4 bedrooms on the main floor and a 5th bedroom, full bathroom plus a loft on the second floor, the perfect guest suite or teenage retreat. Privately situated, the master suite is complete with a walk-in shower with built-in bench, garden tub, twin vanities and walk-in closet. A French door provides access from the bedroom to the screened lanai. Overlooking the spacious family room. Upgraded gourmet kitchen features stainless steel appliances, tile backsplash, granite counters and 42” wood cabinets. French doors lead from the family room to the screened in lanai where you can relax while enjoying views of the beautiful green backyard. . . Vista Lakes was voted "Best Community" by Parade of Homes. Brand New fitness center remodeled (in 2013) Amenities Center along with Beautiful resort style and Olympic style pools even a kiddie pool with an elephant shower! Wind down the waterside which Vista Lakes is famous for, play tennis, ride bikes, walk or jog around Vista Lakes on the wide paths, play ball in the parks, or walk to shopping and dining at some of the fantastic restaurants. Community is in a great location with ease of access to 417, 528, Disney and attractions, Orlando, Valencia East Campus & UCF area, Lake Nona and beaches! Listing courtesy of MNT INTERNATIONAL. Selling Office: DS REALTY GROUP LLC.